As Community Curator at London Transport Museum, my role was to engage local people with the collection of transport posters. 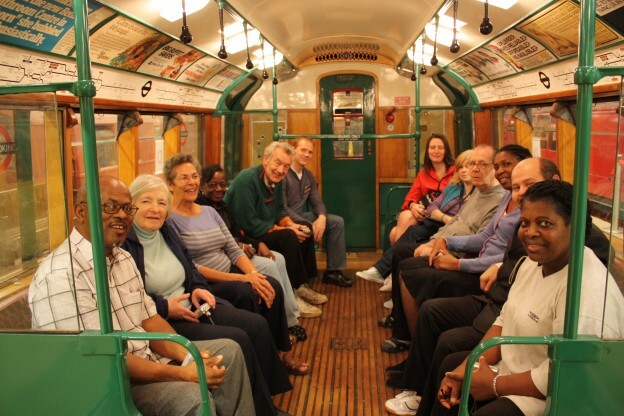 Acton Community Forum Digital Learners visit the London Transport Museum Depot in Acton. I developed partnership projects with Ealing Libraries and Acton Community Forum to create two short courses inspired by the collection. This involved careful planning in collaboration with local workers to establish their aims and objectives, and to identify how we could support them, whilst meeting the needs of the Museum and funders. The projects all built on successful grassroots work happening in the area, drawing on local knowledge and contacts to develop existing projects with the added benefits of a museum collection. By using the Collections Trust Revisiting Collections approach, we gathered new knowledge and feedback on the collections to add to the collections database, whilst giving new audiences a meaningful experience. I collaborated with marketing, learning, digital and curatorial colleagues to research and find appropriate collections content and to maximise the potential of the projects. I collaborated with the Libraries to create a project for recent refugees in Acton to use the posters as a springboard for learning English and increase their understanding and confidence when using London’s public transport system. I collaborated with the Community Forum to develop their work on the national Digital Champions project, supporting people to develop their digital skills. We created a project where the group used the Museum’s website to explore the collections, learnt digital photography skills at the museum store, and shared the results via social media. See photos from the sessions on LTM’s flickr pages here. I initiated a third project to interpret posters which were to be donated to the Paintings in Hospitals programme. Participants on a Health Walks scheme worked with a sound expert to record the things they heard in local parks, these were then developed into soundscapes to accompany the posters. They could be heard alongside the posters in the museum, and were available to hear via QR codes when the posters were later displayed in GP waiting rooms. You can read blog posts about the project on the LTM website here.